I woke up this morning as I do most Mondays: Pissed off and sad, because we just had a great weekend. But then I remembered it's a short work week because we are going away this weekend on a mini-vacation! And all was fine. Then I got to work and all of the anxiety I've been hiding from over the long weekend came rushing back to meet me, so I spent all of day sighing, hemming and hawing with stress and anxiety seeping out of my pores. However, as much as I want to close the computer, finish my wine and go to bed, I also wanted stop and do at least ONE THING for me today - even if it's just recapping a weekend that was wonderful, yet not very exciting! For us, summers usually mean a booked calendar. We are typically always going somewhere or having visitors, and this summer is no different. We have about one weekend each month this summer where there are NO plans, and in July, that weekend was over the Fourth of July. We kicked off the weekend on Thursday evening after work. We visited a local brewery (Begyle, for any craft beer lovers) for some flights and drafts, and then planned to go eat at a new BBQ restaurant. However, dearest Liam had other plans, and for the first time in 6 months of taking him out to dinner with us, we ended up ordering our food to go. Don't worry, there were no epic meltdowns or anything like that - he was just pretty fussy and we could tell he was tired, so we just packed up and went home! Friday we both had the day off of work. One of my besties was in town for a wedding, so we congregated at my other bestie's house in the suburbs for a little BBQ! We had a great time just hanging for a few hours and having our littles try to figure out that they are going to be best friends like their mommies. On Saturday, we totally just played the day by ear. 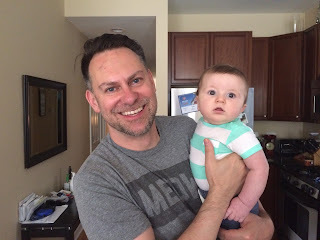 Liam officially started teething this weekend (as in, has swollen gums and teeth trying to break through), so he was pretty out of sorts and fussy. Regardless, we went and grabbed a late brunch alfresco to take advantage of the amazing weather (sunny and 80s in July vs 100 and humid? YES PLEASE!). Then we took a walk, which Liam fell asleep on, so rather than take him inside and wake him, we just had some cocktails on the front porch until he woke up. A friend of mine was in town for the weekend, so we met up at a BBQ for a short while in the afternoon before taking the bambino back home for the night. Fireworks were not really an option for us this year for many reasons, but it was all good! We put Liam down, and headed out to the back deck where we saw fireworks from afar and enjoyed (more) cocktails and each other :). Sunday, we got some stuff done around the house in the morning, then played in Liam's pool for awhile. 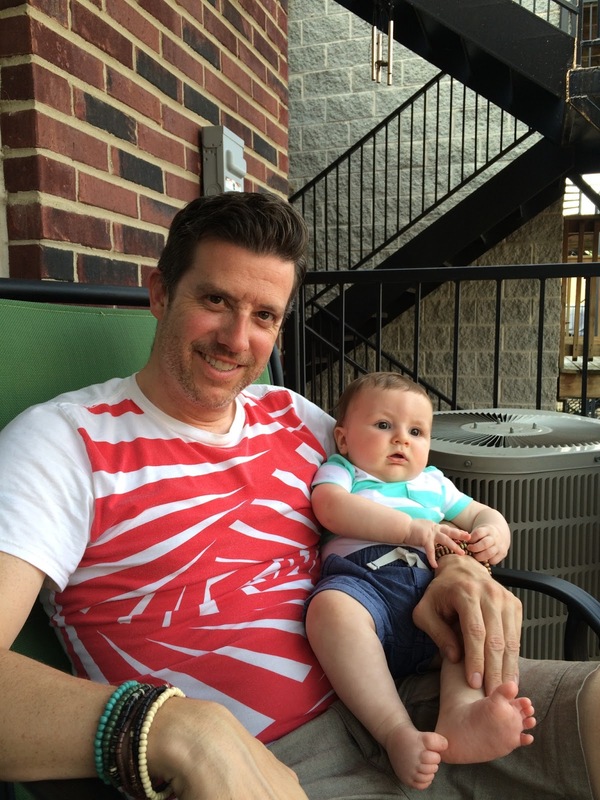 Late afternoon, Liam's "guncles" (self-proclaimed gay uncles, LOL), came by to meet Liam and have some margaritas! So all in all, while it was SUPER low-key, we still got in some fun activity and most importantly, spent time as a family. Would it have been nice to have gone home and partaken in some more "family friendly" activities, like parades, fireworks, pool parties, etc....it was just as nice to just be with each other in the moment, and have that be enough. This weekend, we are headed to Michigan for our second annual "Friends Family Weekend!" Last year for the 4th, we went to Nashville with my three best friends, and we were all pregnant. Now we've all had the babies, so we thought it'd be fun to get together for another trip! We are headed to Michigan, where we rented a house on Lake Michigan. I assume that with 4 babies ranging from 6-10 months, we will just hunker down at the house and spend time at the private beach/pool, and that is just fine with me! I can't wait. Hope ya'll had a great 4th of July!